Ahead of Super Bowl LII, current and former NFL players square off in the kitchen for a good cause. The nacho piles, wing sauce rivers and soda cases of Super Bowl LII are just under a month away. But thanks to another round of PepsiCo’s Game Day Grub Match campaign, three former NFL players have already started cooking. In a new installment of the online cooking show, Super Bowl champion and wide receiver Greg Jennings, New York Jets center Nick Mangold and running back Rashad Jennings square off on a custom-built, football field-inspired set to determine who can prep the best game-day menu with PepsiCo ingredients. "We developed challenges that would lead to dishes that could call for super creative uses of both the food and drink products," said Cristina Cerullo, creative director at Vox Creative. "We obviously also wanted the dishes to feel appropriate for game day—which the athlete-chefs had no problem doing." Game Day Grub Match debuted in the runup to Super Bowl XLIX three years ago, with three chefs competing for an all-expenses-paid trip to the game. This year, the players competed for a $25,000 donation by the PepsiCo Foundation to a food bank in the city of their choice. The winner’s wings will appear on the Super Bowl Weekend menu at the Mall of America’s Buffalo Wild Wings, ten miles from this year’s game. For each dish, the players were required to use at least two PepsiCo products, selected from a pantry built on set. Thanks to the company’s many subsidiaries, there were plenty of options to choose from. "Showing the breadth of PepsiCo's products was the goal of the campaign," said Cerullo, "so we developed the creative around really leaning into the products." That led to things like a Mountain Dew glaze for chicken wings and Quaker Oats in a burger patty, along with more expected choices like a veggie wrap featuring Sabra hummus. Vox’s challenge, meanwhile, was figuring out how to fit the full narrative arc of a cooking show into a share-friendly spot. Typically, digital episodes of such shows run at least ten minutes, which is too long for a video that needs to travel across multiple social platforms. So the team watched episodes from their own favorite shows to determine what was essential. "We tried to include all of the elements that make those shows so engaging and cut all of the moments that the viewer never really needs," Cerullo said. 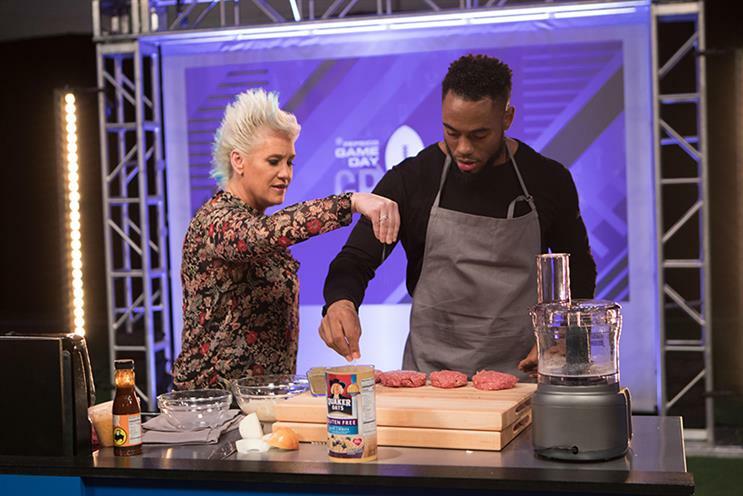 This was her team’s first time producing a cooking show at this scale, and they needed to engage viewers who were interested in both sports and food. They leveraged the authority of their sister sites at Vox—sports site SB Nation and foodie-focused Eater—for guidance, an advantage available to them as the company’s in-house agency. "We tried to take cues, tonally, from both those networks, and reach audiences with those combined interests," said Cerullo. Humor is an important element of Vox’s editorial voice, and luckily for the creatives, having football players as their stars made that part easy. "Chefs tend to take themselves really seriously, so given the athletes were not trained, there was a certain levity to the competition that felt refreshing," Cerullo said. With chefs as the judges, scoring was a serious matter, and the episodes carve out plenty of time time to amp up the suspense—that’s one part Cerullo’s team couldn’t leave out. As for the cooking itself, Cerullo said the athletes had more than decent chops and pulled off the challenges with surprising skill. "We were really pleased, given the range of abilities. No one burned the place down."